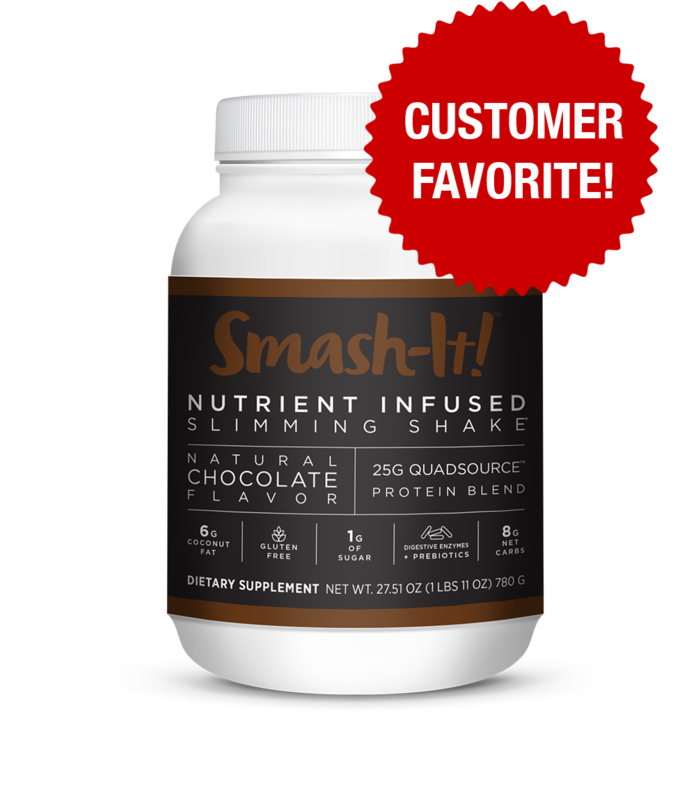 Custom formulated to give you the energy boost you need without the unnecessary calories and sugar. Warning: Do not open this energy floodgate within 12 hours of going to bed. 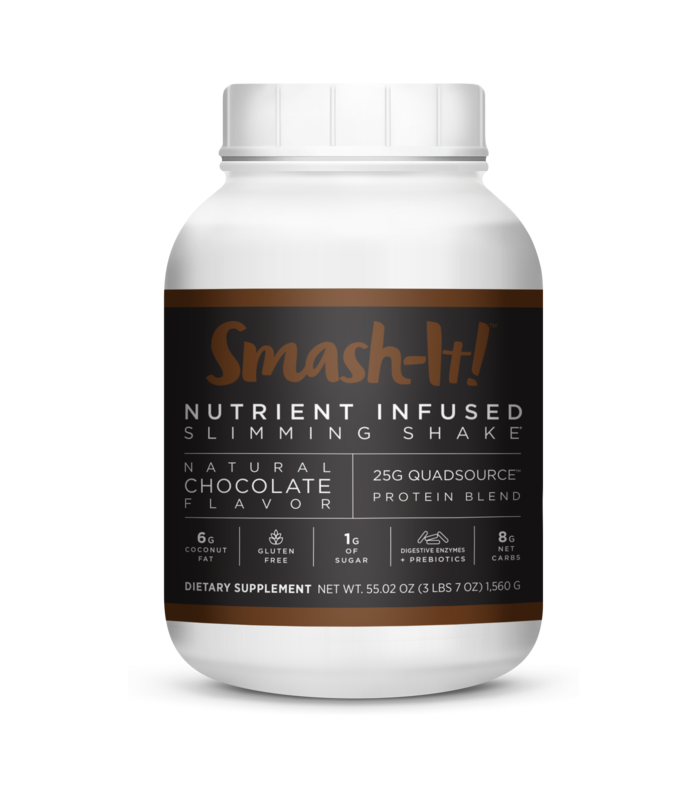 MMA fighters, overnight doctors and Russian Cosmonauts all use these ingredients for unstoppable energy. 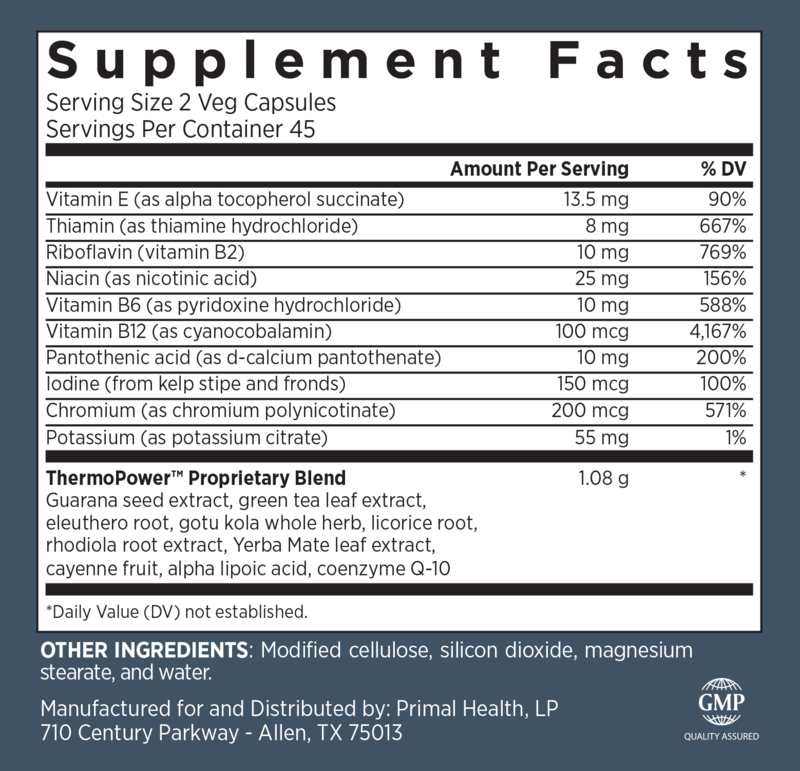 If your days feel sluggish and unproductive, ThermoPower's, 22 energizing extracts provide a powerful punch of pizzazz. First, there's lodine. This helps regulate your thyroid—your body's gateway to boundless energy. 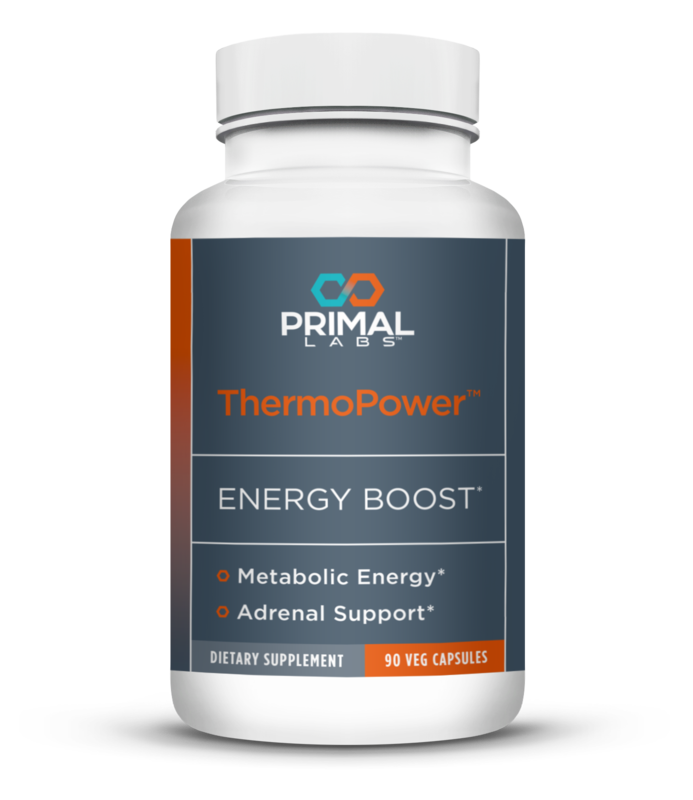 Now you feel the remarkable effects of ThermoPower's, Yerba Mate, Guarana and Eleuthero Root extracts. 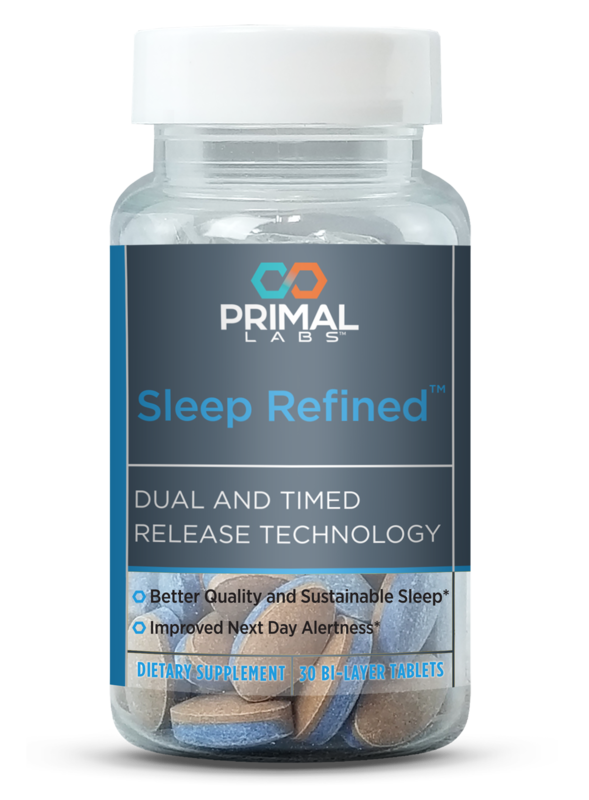 These natural stimulants provide a slow release of energy throughout the day. You're not bouncing off the walls like you are on a coffee high. Your mind is sharper. Your concentration is higher. And you have an unending well of controlled stamina. 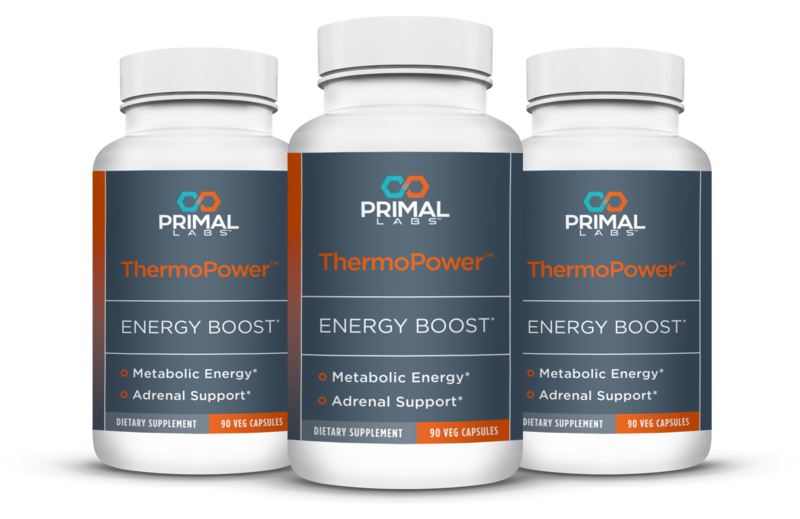 ThermoPower contains a balance of B-Vitamins to prevent brain fog. Plus, you feel the amazing effects of CoQ10. This is your body's "spark", which carries energy to your cells. Every ingredient in this pill is 100% natural and safe. It is manufactured in a USA facility that exceeds the FDA's "good manufacturing practices." 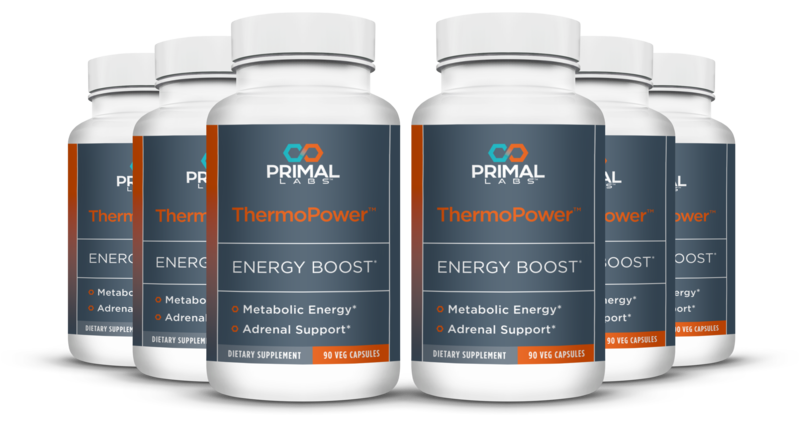 You'll be thrilled with the unstoppable—yet controlled—energy ThermoPower grants you, so stock up today! Albarracin C, Fuqua B, Geohas J, Juturu V, Finch MR, Komorowski JR. J Cardiometab Syndr. 2007 Spring;2(2):91-7. Albarracin CA, Fuqua BC, Evans JL, Goldfine ID. Diabetes Metab Res Rev. 2008 Jan-Feb;24(1):41-51. Anderson RA, Cheng N, Bryden NA, Polansky MM, Cheng N, Chi J, Feng J. Diabetes. 1997 Nov;46(11):1786-91. Baggio E, Gandini R, Plancher AC, Passeri M, Carmosino G. Mol Aspects Med. 1994;15 Suppl:s287-94. Balk EM, Tatsioni A, Lichtenstein AH, Lau J, Pittas AG. Diabetes Care. 2007 Aug;30(8):2154-63. Ellis FR, Nasser S. Br J Nutr. 1973 Sep;30(2):277-83. Hashimoto S, Kohsaka M, Morita N, Fukuda N, Honma S, Honma K. Neurosci Lett. 1996 Dec 13;220(2):129-32. Heinrich U, Moore CE, De Spirt S, Tronnier H, Stahl W. J Nutr. 2011 Jun;141(6):1202-8. Hofman-Bang C, Rehnqvist N, Swedberg K, Wiklund I, Aström H. J Card Fail. 1995 Mar;1(2):101-7. Josse AR, Sherriffs SS, Holwerda AM, Andrews R, Staples AW, Phillips SM. Nutr Metab (Lond). 2010 Aug 3;7:65. Kawada T, Hagihara K, Iwai K. J Nutr. 1986 Jul;116(7):1272-8. Lee BJ, Huang YC, Chen SJ, Lin PT. Nutrition. 2012 Mar;28(3):250-5. Lejeune MP, Kovacs EM, Westerterp-Plantenga MS. Br J Nutr. 2003 Sep;90(3):651-59. Martin J, Wang ZQ, Zhang XH, Wachtel D, Volaufova J, Matthews DE, Cefalu WT. Diabetes Care. 2006 Aug;29(8):1826-32. Morisco C, Trimarco B, Condorelli M. Clin Investig. 1993;71(8 Suppl):S134-6. Ohta T, Ando K, Iwata T, Ozaki N, Kayukawa Y, Terashima M, Okada T, Kasahara Y. Sleep. 1991 Oct;14(5):414-8. Regland B, Andersson M, Abrahamsson L, Bagby J, Dyrehag LE, Gottfries CG. Scand J Rheumatol. 1997;26(4):301-7. Singer GM, Geohas J. Diabetes Technol Ther. 2006 Dec;8(6):636-43. Snitker S, Fujishima Y, Shen H, Ott S, Pi-Sunyer X, Furuhata Y, Sato H, Takahashi M. Am J Clin Nutr. 2009 Jan;89(1):45-50. Werbach MR. Altern Med Rev. 2000 Apr;5(2):93-108. Westerterp-Plantenga MS, Smeets A, Lejeune MP. Int J Obes (Lond). 2005 Jun;29(6):682-8. Wilson BE, Gondy A. Diabetes Res Clin Pract. 1995 Jun;28(3):179-84. Yamada N. Psychiatry Clin Neurosci. 1995 Dec;49(5-6):305-7. Yamadera H, Takahashi K, Okawa M. Psychiatry Clin Neurosci. 1996 Aug;50(4):203-9. Yamadera W, Sasaki M, Itoh H, Ozone M, Ushijima S. Psychiatry Clin Neurosci. 1998 Jun;52(3):311-6. Yoshioka M, Doucet E, Drapeau V, Dionne I, Tremblay A. Br J Nutr. 2001 Feb;85(2):203-11. Yoshioka M, Lim K, Kikuzato S, Kiyonaga A, Tanaka H, Shindo M, Suzuki M. J Nutr Sci Vitaminol (Tokyo). 1995 Dec;41(6):647-56. Yoshioka M, St-Pierre S, Drapeau V, Dionne I, Doucet E, Suzuki M, Tremblay A. Br J Nutr. 1999 Aug;82(2):115-23. Yoshioka M, St-Pierre S, Suzuki M, Tremblay A. Br J Nutr. 1998 Dec;80(6):503-10.